The MB-E-6DOF/12/1000KG is capable of handling a Gross Moving Load (GML) of 1,160 kg (2,554 lb) and is comprised of six 12 inch stroke electric actuators. The MB-E-6DOF/26/1800KG is capable of handling a Gross Moving Load (GML) of 1,800 kg (3,968 lb) and is comprised of six 26 inch stroke electric actuators. 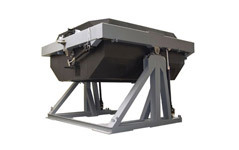 The MB-EP-6DOF/26/3000KG is capable of handling a Gross Moving Load (GML) of 3,000 kg (6,600 lb) and is comprised of six 26 inch stroke electric actuators. The MB-EP-6DOF/36/5000KG is capable of handling a Gross Moving Load (GML) of 5000 kg (11,000 lb) and consists of six electric pneumatic actuators. The MB-EP-6DOF/40/8000KG is capable of handling a Gross Moving Load (GML) of 8,000 kg (17.637 lb) and consists of six electric pneumatic actuators. The MB-EP-6DOF/60/8000KG is capable of handling a Gross Moving Load (GML) of 8,000 kg (17.637 lb) and is comprised of six electric pneumatic actuators. The MB-E-6DOF/60/14000KG is capable of handling a Gross Moving Load (GML) of 14,000 kg (30,800 lb) and is comprised of six electric actuators. The MB-EP-2DOF/3400KG is capable of handling a Gross Moving Load (GML) of 3,400 kg (7,495 lb) and is comprised of two 50 inch stroke electric actuators and two 20 inch stroke electric actuators. The cabin can realize roll angles up to ± 30 degrees and the Gimbal-Cabin assembly can pitch up to ± 45 degrees. The MB-EP-5DOF/8/3000KG is capable of handling a Gross Moving Load (GML) of 3,000 kg (6,614 lb) and is comprised of four 8 inch stroke electric actuators, two 8 inch pneumatic actuators and one 20 inch electric actuator for the lateral rail.